Dress up and style your favorite characters from the Nickelodeon cartoon ATLA, then arrange them however you like! 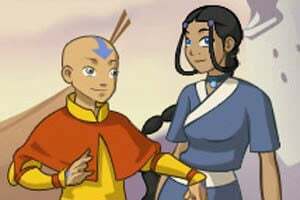 The game features waterbender Katara, her brother Sokka, Aang the avatar and airbender, Prince Zuko, Princess Azula and Zuko's girlfriend Mai. With more limited options you can also add Toph, Suki, Ty Lee, and Princess Yue. You can take any existing clothes from the Four Nations and transform them. Create a Water Nation princess, Fire Nation peasant, Earth Nation warrior or Air monk! omigosh I never realized that ty lee could turn upside down in this. That's awesome. A remake would be noice. Korra and all! EVERYONE GETS TO BE AN AIR BENDER!!!!! All I want is KORRA!!!!!!!! IT'S A GIANT.... MUSHROOM! MAYBE IT'S FRIENDLY!